U.S.-Backed Guaidó To Meet With Pence, Latin American Leaders Over Venezuela Crisis The meeting is set for Monday in Bogota, Colombia. At least four people were killed in clashes at the border Saturday, as military forces blocked humanitarian aid from entering the country. 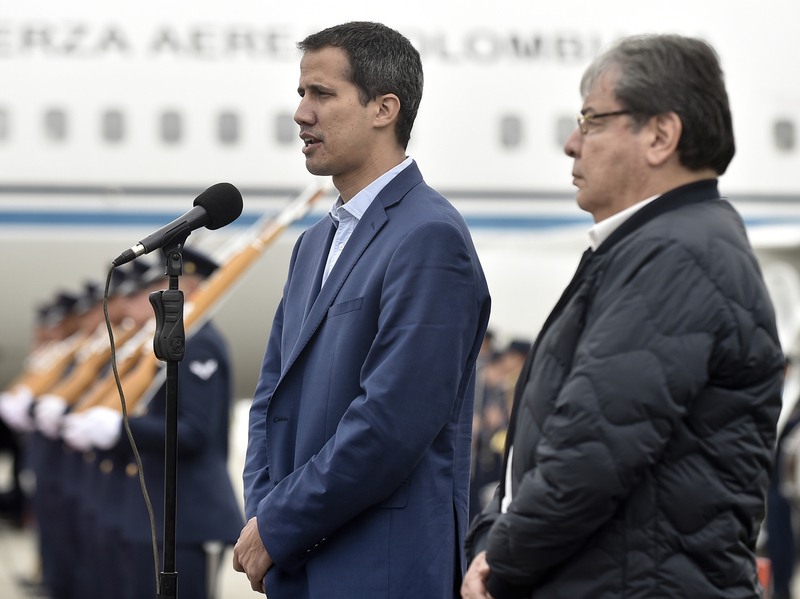 In this photo released by Colombia's presidential press office, Venezuelan opposition leader Juan Guaido makes a statement as Colombian Foreign Minister Carlos Holmes Trujillo stands by at a military airport on Sunday. Venezuela's opposition leader Juan Guaidó has called for international allies to consider "all options" in an effort to free the country from President Nicolas Maduro, a day after deadly clashes at the border between protesters and the military. Guaidó, who is recognized as the legitimate leader of Venezuela by dozens of countries, will meet with Latin American leaders and U.S. Vice President Mike Pence on Monday in Bogota, Colombia, to discuss the situation. At least four people were killed in clashes on Saturday, as military forces blocked humanitarian aid from entering the country. U.S. officials have warned they will take action in Venezuela. Secretary of State Mike Pompeo said Saturday on Fox News that the U.S. was still considering "every option," including military interference. "There's more sanctions to be had," Pompeo told CNN on Saturday. "There's more humanitarian assistance, I think, that we can provide. I think we'll find other ways to make sure that food gets to the people who need it." The U.S. has backed Guaidó as the country's interim president amid an escalating political and humanitarian crisis. Venezuela's neighbors in the region, including Brazil and Colombia, have also recognized Guaidó as Venezuela's leader, following Maduro's widely disputed re-election last year. Maduro, who is backed by Russia and China among other countries, maintains he is the legitimate president. "There was broad hope here that there would be some kind of swift resolution after yesterday," NPR's Eyder Peralta reports from Caracas. "Guaidó seems to have put on the brakes a little bit, wanting more diplomacy." About 60 Venezuelan military forces defected on Saturday during confrontations over aid at several bridges along the country's border with Colombia, NPR's John Otis reports. But the majority of the military appeared to remain loyal to Maduro, firing rubber bullets and tear gas into the crowd and sparking stampedes. Hundreds of people were injured in the clashes, and most of the food and medical supplies remained on the Colombian side of the border. Some trucks with humanitarian aid did manage to enter the country from Brazil, The Miami Herald reports. "It seemed like Guaidó and the opposition lost the aid battle because there was so much at stake to get this aid into Venezuela," Otis reports from the border. "But on the other side, the optics were extremely bad for Nicolas Maduro." A young lawyer who wouldn't give NPR her full name over concerns about her family's welfare, was pouring sand, motor oil and gasoline into beer bottles to make Molotov cocktails at the border. She told Otis that she believes violence is necessary to liberate Venezuela and that she was acting on behalf of her children. Meanwhile, in the nation's capital Caracas, a mass of Venezuelans marched to the military airport La Carlota on Saturday to support Guaidó, Peralta reports. As the crowd started thinning, some military forces came out wearing ski masks and gave protesters the middle finger. Elsewhere in the city, Maduro held a pro-government rally, where he broke off diplomatic relations with Colombia. "The government is jubilant," Peralta says. "They believe they won this battle."